As the digital humanities mature, their scholarship is taking on many characteristics of the sciences, becoming more data-intensive, information-intensive, distributed, multi-disciplinary, and collaborative. While few scholars in the humanities or arts would wish to be characterized as emulating scientists, they do envy the comparatively rich technical and resource infrastructure of the sciences. The interests of all scholars in the university align with respect to access to data, library resources, and computing infrastructure. However, the scholarly interests of the sciences and humanities diverge regarding research practices, sources of evidence, and degrees of control over those sources. This talk will explore the common and competing interests of disciplines for scholarship in the digital age. 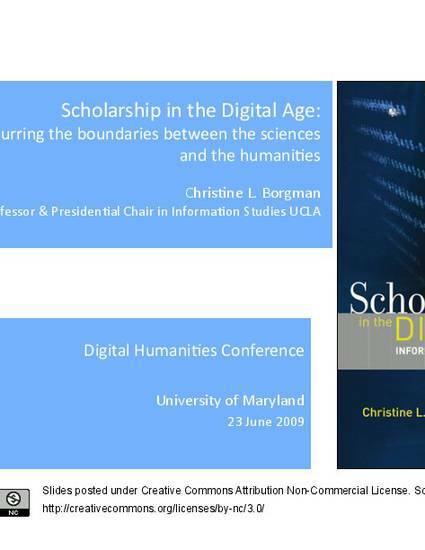 Scholarship in the Digital Age: Blurring the Boundaries between the Sciences and the Humanities by Christine L. Borgman is licensed under a Creative Commons Attribution-Noncommercial 3.0 United States License.